This hotel is on the beach, near the wharf and boardwalk. **Important** Please call the CfAO at 831-459-5592 or 831-459-5711 BEFORE making your reservation. UC Santa Cruz has an agreement with the Dream Inn to give UC business travelers a discounted rate. This agreement number MUST be given to the hotel when you make your reservation. Take Highway 880 South, which will change into Highway 17. This becomes a mountain road. Take Highway 1 North, towards Half Moon Bay, and continue to follow the signs that say, "Highway 1". Highway 1 will no longer be a freeway, but will become a city street as you take a right turn onto Mission Street. Turn left onto Bay Street. The road will dead-end on West Cliff Drive. Turn left onto West Cliff Drive, and you will see the hotel on the right. Go back up Bay Street and continue until you reach the UCSC campus entrance. Bay Street changes its name to Coolidge Drive. You will need A PARKING PERMIT, so stop at the kiosk on the right, just past the entrance, to purchase one ($6.00 per day). Turn right, out of the kiosk parking lot and proceed on Coolidge. Coolidge becomes McLaughlin Drive. If the Kiosk is closed, drive 3/10 of a mile beyond the campus entrance. Drive past the Blacksmith Shop on the left, and take the next Right turn. Turn immediately right again, and drive to the end, to the H Barn. There will be a table out in front of the H Barn where you can pick up your parking permit, or you can go inside. After purchasing your parking permit ($6.00), drive back to Coolidge and turn Right. (Coolidge will become McLaughin). Make an immediate Left off of Heller into the Parking Structure entrance. Walk to level 2 East. Walk down the stairs located next to the elevator on level 2 East. Walk through the redwood trees on the asphalt walkway, and up the stairs. 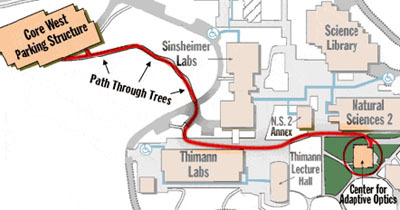 Cross the street and follow the sign to "Clark Kerr Hall, Thimann Labs, Thimann Lecture Halls", walking up the 5 stairs. Turn left and continue walking straight. Walk under the first set of gray painted steel "flying buttresses" and turn right onto the walkway leading to the Center for Adaptive Optics Building.